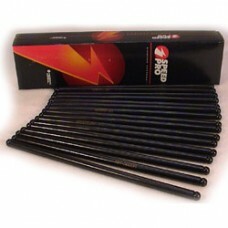 Speed-Pro’s performance pushrod sets are ideal for the budget conscious performance enthusiast. They have many features normally found in more expensive pushrod, and are sold in economically priced sets to complete a professional engine build. Made in the USA from high quality 1010 steel and hardened to make them guide plate compatible, tumble polished to remove surface imperfections and black oxide coated for corrosion protection and a professional appearance. Designed for Small Block Chevrolet with hydraulic flat tappet cam. 5/16” Diameter, 7.894” Length (.100” longer than stock).